EML files are email files that conform to an open format specified in a document called RFC-822. Although Outlook cannot directly convert email to .eml format, this ability can be added to Outlook after installing MessageExport. MessageExport is an add-in for Microsoft Outlook. It integrates tightly with Outlook through the Outlook toolbar. 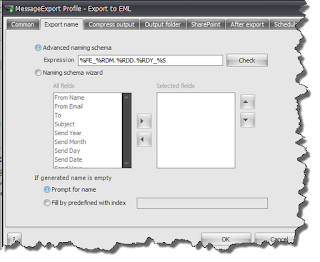 To use MessageExport, select the email messages in the Outlook maillist that you want to export to eml format. You can select a range of email messages by holding down the Shift-key. To select multiple emails individually, hold down the Control-key while you click on email messages. To select all messages in the list, type Control-A. After your messages are selected, go to the MessageExport toolbar. Select "Export to EML" and then click the blue Export button to start the process. MessageExport will begin counting your messages, and will then start the export process. You will be prompted to select a target folder for the .eml files s if a folder has not been specified in the "export to eml" profile. If you are exporting a large number of Outlook messages to .eml, you may want to make a few a folder to hold all of your messages. It's not a good idea to export a large number of emails directly to your Windows desktop, as it will clutter your desktop and slow Microsoft Windows. The export process will continue until all of the Outlook emails have been exported to .eml format. The amount of time required to complete the export depends on a few factors. Text formatted emails are converted very quickly. HTML emails that have graphics hosted on an internet server require additional time to download those elements. Speed is also affected by the resources on your computer. More memory, a fast hard disk drive, and a fast processor will help speed the job along. As the export continues, you will be able to track MessageExport's progress with the status bar. The MessageExport "Export to EML" export format is a set of instructions that can be edited by the user, giving lots of control over how MessageExport performs its functions. 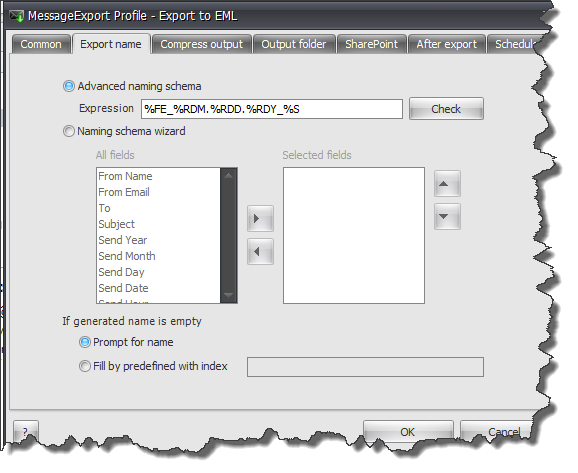 For example, if you want to change how MessageExport names the .eml files, click the settings button and go to the Naming tab. MessageExport is a versatile add-in for Microsoft Outlook that expands Outlook's ability to export email to many different formats, including .eml format. Encryptomatic LLC is the developer of MessageExport, and they offer a free 15 day trial. After the full trial, you can continue to use MessageExport to export messages individually, and can activate the full version at any time. Download a free trial of MessageExport.